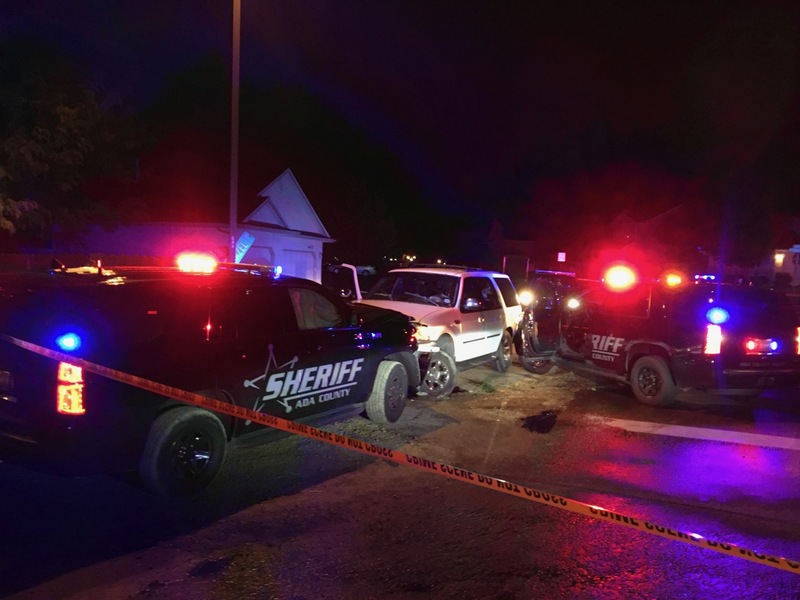 An Ada County Sheriff’s deputy shot at a man who drove his SUV into an ACSO patrol vehicle early Saturday morning as deputies were investigating a domestic disturbance call. The shooting occurred at the end of a brief vehicle pursuit through a south Ada County neighborhood by Lake Hazel Road around 4:30 a.m. Saturday. Three deputies were involved in the arrest of 35-year-old Michael L. Jockumsen. One deputy, D. J. Rupert, fired at Jockumsen. Rupert has been with the ACSO since 2008. The deputies involved in the incident do not appear to be have suffered significant injuries. Jockumsen was not injured. Jockumsen is charged with felony eluding and misdemeanor counts of resisting arrest and DUI. More charges are possible. Deputies began their investigation at 4:14 a.m. when they went to a home in the 10000 blocks of W. Jerry Peak Street to investigate a report of a fight. Once deputies determined Jockumsen was involved in the incident, they asked him to get out. He took off instead. Two deputies got into their patrol vehicles and followed after Jockumsen, who went through several neighborhood streets until he lost control of the Expedition and spun out on South Solar Way. The pursuit lasted less than five minutes and covered about 2 miles. One deputy then moved his patrol vehicle into the front of the Expedition to keep him from driving away when both vehicles collided. Another deputy pulled in behind the SUV. The deputy in front then saw Jockumsen reach down into the SUV, where he appeared to be looking for something. The deputy then fired two rounds at Jockumsen’s SUV. At that point, Jockumsen turned off the SUV and surrendered. Jockumsen was taken to a hospital for an evaluation and brought back to the Ada County Jail. Jockumsen is set to make his initial court appearance on the charges Monday afternoon. The case is being investigated by the Ada County Critical Incident Task Force, which does an independent investigation of all uses of lethal force by law enforcement in Ada County. Boise Police is the lead agency for this incident.